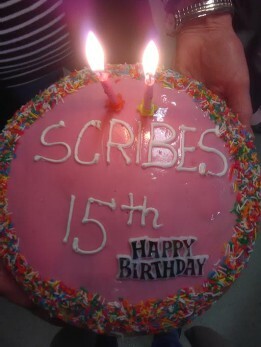 Enjoying the memories and stories from all of us at Scribes. 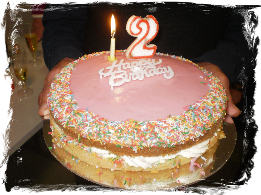 Doesn't seem like 12 months since our last birthday. How time flies! The end of another year already. 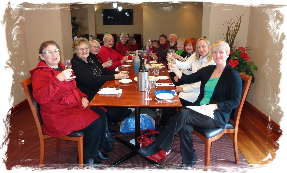 As usual some plans were laid for the new year then we got on with celebrating another productive year. 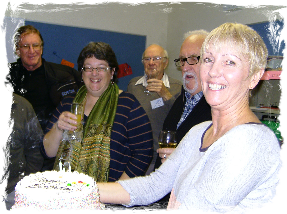 Another birthday rolls around for Scribes Writers. 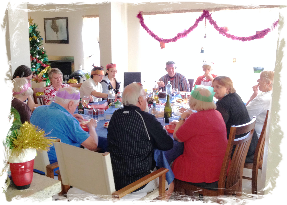 Although not our full contingent, it was celebrated as always with great festivity. 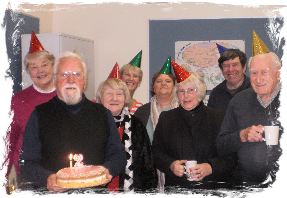 We are now 14 years old and hopefully have many more to enjoy. 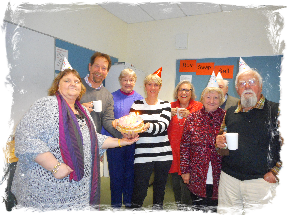 Unlucky for some, but 13 was lucky for Scribes Writers celebrating their 13th birthday. A great testiment to the group keeping the writing word alive. Wow! 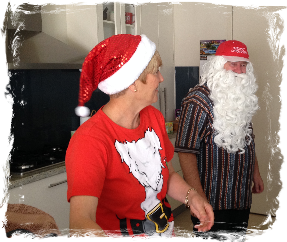 Who would have thought that Santa and one of his elves would turn up at our break-up party. 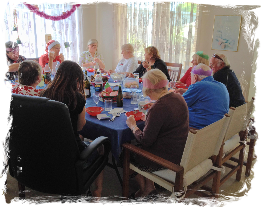 We even had a beautiful rendition of some carols by three angels. 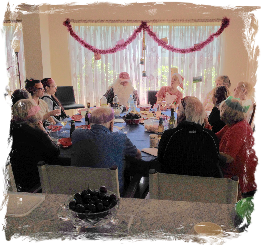 Seriously though, after some plans were laid for the new year a great time was had by all as another productive year was celebrated. 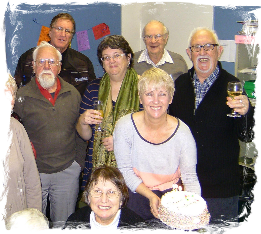 Three Cheers to Scribes Writers on their 12th birthday celebrated at the South Barwon Community Centre. 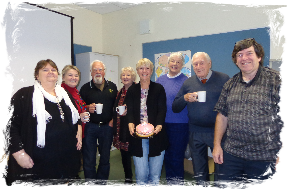 Although a few of our members were away, it was great to see those of us present enjoying the wonderful years we’ve notched up and to recount all the good memories. 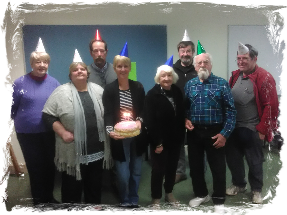 As several of the members would be MIA during July, Scribes Writers decided to celebrated the Group's 11th birthday in June this year. 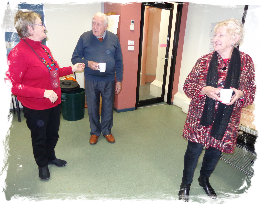 Despite being one month early the event was enjoyed with the usual enthusiasm. 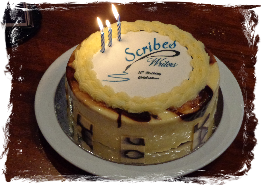 Once again, in July, Scribes Writers celebrated the Group's birthday. This time their 10th. 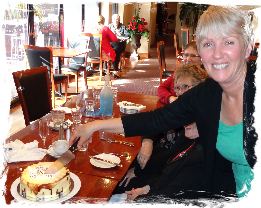 A lunch at Jokers in Geelong was used to celebrate the event on the 11th July with excellent food, good company, the obligatory champers and cutting-of-the-cake ceremony. 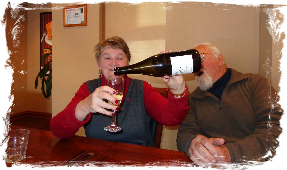 As can be seen by the snaps some, having snaffled the champers bottle, enjoyed the event more than others. 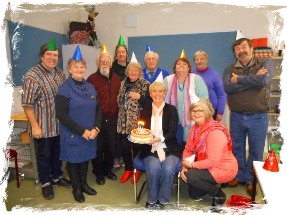 In July Scribes Writers celebrated the 9th birthday of the group. How time flies when you are doing what you enjoy!